It's been more than a year since the Dirk Gently pilot, loosely based on Douglas Adams' Dirk Gently's Holistic Detective Agency books, but the detective is returning to television, with three new episodes from Misfits creator Howard Overman. The original Dirk Gently pilot aired in December 2010 (you can read our recap here), and BBC Four is eager to seem more of the Adams-inspired inanity. 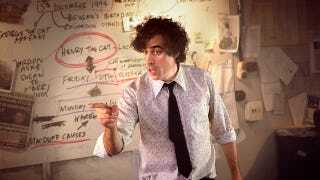 Stephen Mangan will be back as Gently, the detective who solve cases by examining the interconnectedness of all things, and actors Darren Boyd (Richard Macduff), Lisa Jackson (Janice Pearce), Helen Baxendale (Susan), and Jason Watkins (Det. Insp Gilks) will return as well. In Episode 1 of this new three-part series, Dirk discovers the connection between two unrelated cases; a client who believes the Pentagon are trying to kill him and another who's horoscopes appear to be coming true. In Episode 2 Dirk is called back to his old university to protect a valuable robot but within 24 hours it has been stolen and a dead body discovered, with Dirk & Macduff the prime suspect. In Episode 3 they are alarmed to discover that Dirk's old clients are- being randomly murdered with Dirk as the only link. Rather than talk to the police, Dirk elects to leave the country but is waylaid by a series of seemingly unconnected events.